The precise mechanism of how the regulatory T cell population elicits and maintains tolerant state in activated T cells is poorly understood. To address this issue, we established an in vitro coculture system using mouse T cells and showed that tolerant state is serially passed from preinduced-tolerant T cells into new TCR-stimulated T cells across generations in a dendritic cell–independent manner. In this successive induction process of tolerant state, TIGIT was found to play an important role: TIGIT expression on induced-tolerant T cells was promoted in stimulated T cells cocultured with the tolerant cells. In addition, these stimulated T cells in the coculture also expressed high B lymphocyte-induced maturation protein 1 accompanied by IL-2 suppression. Because CD155, a partner of TIGIT, is known to transduce signaling inside by trans-interaction with its ligands, these phenotypical changes in TCR-stimulated naive T cells were reproduced when naive T cells were double cross-linked by CD3 and CD155. These results indicate that TIGIT enhanced on tolerant T cells may function as a ligand of its paired receptor CD155 to transduce signaling into its expressing naive T cells to accelerate new TIGIT expressions as well as IL-2 suppression via B lymphocyte-induced maturation protein 1 enhancement. In consideration of these results, we propose a novel process in which tolerant state in T cell population is maintained by successive generation of new tolerant T cells from naive T cells as one of the regulating mechanisms in immune responses. Selective suppression of effecter immune function is required to prevent excessive immune reaction, which is regulated by certain subpopulation(s) of T cells. Because CD4+CD25+ T cells were identified as having the potential to regulate overresponse of immune cells (1), their characterization has been extensively studied, particularly after the discovery of Foxp3 (2, 3). Accordingly, numerous molecules that can distinguish effecter T cells from a CD4+CD25+ T cell population with regulatory function have been reported. However, as those molecules are not always shared in all CD4+CD25+ T cells (4–7), they may contain several subsets with distinct functions or suppressive processes. In fact, certain regulatory T cell populations engage in suppressing activation of other T cells by outcompeting costimulatory molecules to bind shared ligands such as CD80/86 on dendritic cells (DCs) or by impairing APC function for activating T cells (6, 8). However, a convincing mechanism of how these regulatory cell populations maintain their tolerant state and suppressive potential toward other effecter cells still remains poorly understood. Current studies of transplantation tolerance have shown that in vitro–induced Foxp3+ regulatory T cells (Foxp3+Treg cells) contribute toward the acceptance of engrafted tissues by generating de novo Foxp3+CD4+ T cells, which are tolerant of engrafted tissues (4, 9, 10). These studies suggest and, in fact, predict a possible process of a tolerant state of T cells being somehow transmitted from the first induced tolerant T cells to newly stimulated T cells across generations. If this “transmission” mechanism of tolerant state can be clarified at a cellular and molecular level, it may be helpful toward obtaining an understanding of how tolerant state of activated effecter T cells is maintained for the long term and also provide more effective therapy for regulating overimmune reaction. To address this mechanism, we established an in vitro experimental system in mice, revealing that tolerant characters in T cells are serially transmitted from the first induced tolerant T cells to newly activated T cells across generations. Serial transmission of tolerant state is driven by the CD155/TIGIT axis, in which stimulated new T cells receive their CD155-driven transducing signal by trans-interaction with TIGIT expressed on induced tolerant T cells, resulting in TIGIT expression and IL-2 suppression. C57BL/6-CAG-EGFP transgenic (Tg) (GFP-Tg) mice, BALB/c, and C57BL/6J mice were purchased from Japan SLC. I-Ad-restricted OVA 323–339-specific TCR (Vβ15)-Tg (OVA-TCR-Tg) mice (11) were backcrossed with RAG-2−/− (I-Ab) mice and BALB/c mice, and OVA-TCR-Tg mice were crossed with GFP-Tg (OVA-GFP-Tg) mice. Foxp3hCD2-CD52 knock-in mice (12) were kindly provided by Dr. Hori (The University of Tokyo). Tigit−/− mice [knockout (KO)] were provided by Dr. A. Shibuya of the University of Tsukuba. The exon 2 of Tigit (5′-CCAAGTCGACTGGAAGCAGC-3′) was inserted into the pX330 vector (Addgene plasmid no. 42230, Cambridge, MA), which was designated as pX330-Tigit. The pX330-Tigit (5 ng/μl) was injected into the pronuclear of pronuclear-stage embryos of C57BL/6J female mice. Shortly after (15 min to 2 h), surviving pronuclear-stage embryos were transferred into the oviducts of pseudopregnant ICR mice, and 87 pups were obtained. These F0 mice were mated with wild-type (WT) C57BL/6J mice, and F1 hetero mice with five-base deletion of Tigit exon 2 were obtained. These F1 hetero mice were mated with each other, and TIGIT KO mice were finally established. The design of pX330-Tigit and the injection, followed by transfer of embryos, were performed by the laboratory animal resource center at the University of Tsukuba. All mice were maintained under specific pathogen-free conditions and used between 6 and 8 wk of age. All mouse experiments were approved by the Animal Experimentation Committee of Juntendo University and were performed in accordance with the Guidelines for Care and Use of Laboratory Animal Experimentation at Juntendo University School of Medicine. Flow cytometric analysis was conducted as described previously (11). The following anti-mouse Abs were used: CD4 (GK1.5), TIGIT (1G9), CD155 (TX56), LAG3 (C9B7W), PD-1 (RMP1-30), PDL-1 (10F.9G2), Tim3 (B8.2C12), CD25 (PC61; all from BioLegend), ICOS (15F9), CD28 (37.51), CTLA4 (UC10-4B9), and CD45R (B220, RA3-6B2; all from eBioScience). For in vitro stimulation, LEAF-purified anti-CD3 (145-2C11) mAb and isotype control hamster IgG and rat IgG2b were purchased from BioLegend. Purified anti-CD155 mAb was provided by Tsukuba University (13). Super-Ag toxic shock syndrome toxin-1 (TSST-1) was purchased from Toxin Technology. Tolerant induction was described previously (14). Briefly, after in vivo induction (25 μg/head, i.p. ), spleen cells were restimulated at 2.5 × 106 cells/ml with 0.1 μg/ml TSST-1 for 24 h. These cells were used as the first tolerant cell. Then, OVA-GFP-Tg spleen cells (1.25 × 106/ml) and an equal number of first tolerant cells were cocultured with OVA (0.1 mg/ml) for 24 h. After culture, GFP− and GFP+ cells were isolated. These GFP+ cells were named the second tolerant cell. The same process was then used for inducing the third tolerant cell. For T cell or non–T cell separate coculture, tolerant T cells (5 × 105/ml) or non–T cells (1 × 106/ml) were cocultured with an equal number of GFP+ naive T cells and GFP+ naive non–T cells in the presence of OVA for 24 h. For cell-to-cell contact culture, we used 24-well plates in a volume of 1 ml. First tolerant cells (1 × 106/ml) were cocultured at a 1:1 ratio with GFP+ naive spleen cells (ordinary culture), together with OVA (0.1 mg/ml). In parallel cultures, GFP+ naive spleen cells were separated from first tolerant cells in the upper chamber of semipermeable transwell (TW) membrane (0.4 μm, Corning; TW culture). We sorted CD4+ T cells and non–T cells by cell sorter (JSAN Cell Sorter, Bay Bioscience) or MACS (Miltenyi Biotec) according to the manufacturer’s instructions. For T cell stimulation, CD4+ T cells (2 × 106/ml) were stimulated with plate-bound anti-CD3 (0.5 μg/ml) and/or anti-CD155 (20 μg/ml) mAbs (13). RNA isolation, cDNA synthesis, and real-time quantitative PCR were performed as described previously (15). The primer/probe sets were obtained from Applied Biosystems (Mm00434256_m1, Mm00439614_m1, Mm03807522_m1, Mm00476128_m1). The relative RNA abundance was determined based on control β-actin (Mm00607939_s1) abundance. CD4+CD25+ T cells from OVA-stimulated T cells or tolerant T cells were purified by cell sorter, and total RNA was isolated using an RNeasy Plus Micro Kit (QIAGEN, Hilden, Germany). Microarray analysis was performed by Cell Innovator (Fukuoka, Japan) using SurePrint G3 Mouse GE 8 × 60K (Agilent, Santa Clara, CA). Relative hybridization intensities and background hybridization values were calculated using Agilent Feature Extraction Software (9.5.1.1). Raw signal intensities and Flags for each probe were calculated from hybridization intensities (gProcessedSignal) and spot information (gIsSaturated, etc. ), according to the procedures recommended by Agilent. Further, the raw signal intensities of two samples were normalized by quantile algorithm with the “preprocessCore” library package in Bioconductor software. To identify up- or downregulated genes, we calculated the Z-scores and ratios (non–log scaled fold-change) from normalized signal intensities of each probe for comparison between controls and experiment samples. Then, we established criteria for regulated genes: (upregulated genes) Z-score ≥2.0 and ratio ≥1.5-fold and (downregulated genes) Z-score ≤ −2.0 and ratio ≤0.66. Full-length cDNA of TIGIT was cloned into pMXs-IRES-GFP. P815 mastocytoma was infected with the above retrovirus as described previously (15). For coculture of TIGIT transfectants, CD4 T cells (1.5 × 106/ml) were cocultured with TIGIT-expressing P815 (1.0 × 106/ml) cells in an anti-CD3 Ab-bound plate. Prism v4.0c software (GraphPad Software) was used for statistical analysis. Statistical analysis results were assessed either by paired or unpaired Student t test (two-tailed) and by Tukey test. The p values <0.05 were considered significant. No statistical methods were used to predetermine sample size. The experiments were not randomized, and the investigators were not blinded to allocation during the experiments and outcome assessment. 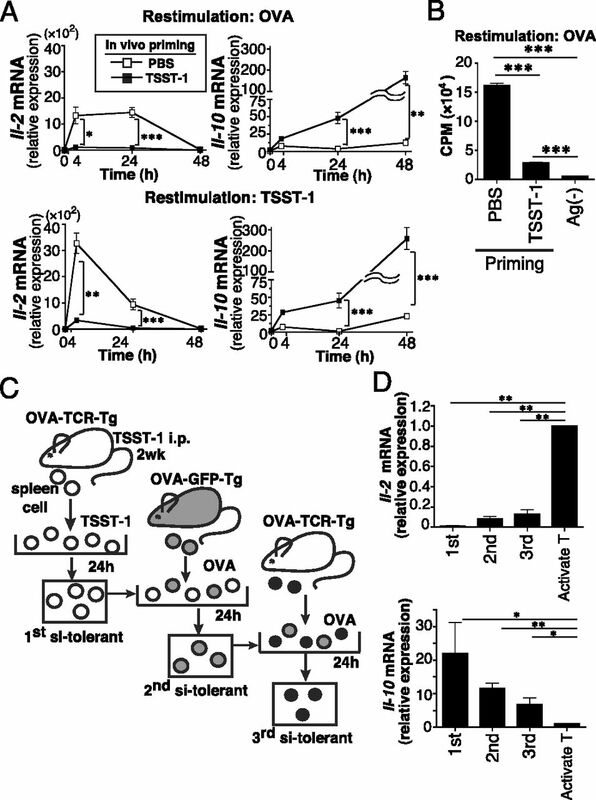 For establishing an in vitro experimental system to investigate whether a tolerant state induced in Ag-experienced T cells substantially transmitted into newly stimulated T cells across generations, we used OVA-TCR-Tg mice that also react strongly to super-Ag TSST-1 through TCR Vβ15 (11, 14). Spleen cells prepared from OVA-TCR-Tg mice that had been injected with TSST-1 or PBS were cultured with OVA or TSST-1. Upon stimulation with either OVA or TSST-1, spleen T cells from TSST-1–injected OVA-TCR-Tg mice showed marked suppression of IL-2 expression in the very early stage, accompanied by decreased cell proliferation, whereas those from PBS-injected mice showed an ordinary bell-shaped curve with a gradual increase from the first 4 to 24 h and then a decrease to 48 h (Fig. 1A, 1B). In contrast to IL-2 suppression, T cells from TSST-1–injected OVA-TCR-Tg mice showed enhanced IL-10 expression in the in vitro culture with OVA. (Fig. 1A). However, there were no major changes in the expression levels of other suppressive cytokines such as TGF-β1 (data not shown) during 48 h.
Induced tolerant T cells confer their suppressive function into activated naive T cells. (A) and (B) Time course of Il-2 and Il-10 mRNA expression (A) and proliferation analysis by thymidine incorporation (B) of restimulated CD4 T cells in vitro. Spleen cells prepared from OVA-TCR-Tg mice receiving in vivo priming with TSST-1 (black square) or PBS (white square) were restimulated with OVA (upper) or TSST-1 (lower) in vitro. The graphs are shown as mean ± SEM of three mice. Data are representative of three independent experiments with three mice per experiment. (C) Schematic model for induction and transfer of tolerant state into naive T cells for generating first, second, and third si-tolerant T cells. (D) Real-time quantitative PCR analysis of Il-2 and Il-10 expressions in first, second, and third generations of tolerant T cells upon OVA stimulation for 24 h. The figure shows the data of si-tolerant T cells compared with those of unsuppressed controls (Activate T). The graphs are shown as mean ± SEM of six mice. Data are pooled from three experiments (total six mice, each two mice per experiments). *p < 0.05, **p < 0.01, ***p < 0.001, unpaired Student t test, two-tailed (A), Tukey test (B and D). Then, to examine whether the initially induced T cells that acquired tolerant state had the potential to suppress the activation of naive T cells in vitro, they were cocultured with naive spleen cells from nonprimed OVA-GFP-Tg mice to distinguish the initially induced tolerant cells (Fig. 1C). Upon OVA stimulation, GFP+ T cells showed tolerant state similar to that of the initially induced tolerant T cells (first tolerant T cells), reduced IL-2 expression, and enhanced IL-10 expression (Fig. 1D). Intriguingly, these second induced tolerant T cells (second tolerant T cells) also generated similar characteristics in newly stimulated T cells to be the third tolerant T cells. These serially induced tolerant T cells with suppressive potential are termed as suppression-inducing tolerant (si-tolerant) T cells in this study. This transmission process of si-tolerant T cells may advance in a TSST-1–independent manner (Fig. 1C), because serial transmission of the tolerant state was induced upon OVA stimulation. It is also of note that the first si-tolerant T cells still showed suppressive potential even if Foxp3+ cells were deleted using Foxp3hCD2-CD52 knock-in mice (Supplemental Fig. 1) (12). Taken together, our established in vitro system showing that once a certain tolerant state is induced in T cells, such a state can be transmitted into the following new generations of stimulated naive T cells, which can represent a proper experimental system to investigate the induction and maintenance of tolerance in the stimulated state at the cellular and molecular levels. Based on our in vitro experimental results, we addressed the issue of which cells, T cells or non–T cells such as DCs, have a crucial role in the transmission of tolerant state. For that, T cells and non–T cells, including DCs and B cells, were isolated from spleen cells precultured for a tolerance-inducing condition, and each isolated population was then cocultured with naive spleen cells in the presence of OVA. The results revealed that IL-2 expression in stimulated naive T cells was greatly reduced (by more than 90%) in the coculture with si-tolerant T cells but was only relatively reduced (by nearly half) with non–T cells in comparison with single culture of naive T cell alone (Fig. 2A). At the same time, we also examined whether this IL-2 suppression in stimulated naive T cells is really led by direct cell-to-cell interaction between tolerant and naive T cells or by soluble factors produced from cocultured cells. For this purpose, naive spleen cells were cocultured with tolerant cells in the presence of OVA in ordinary culture plates or in TW culture plates, in which both cells are separated by semipermeable membrane. The results showed that IL-2 suppression in stimulated naive T cells was much less in TW culture (50%) than in ordinary culture (90%) (Fig. 2B). Cell-to-cell contact between tolerant T cells and naive T cells is crucial for generating the next si-tolerant T cells. (A) Expressions of Il-2 mRNA in OVA-stimulated naive T cells after 24-h coculture with tolerant T or non–T cells or single culture of naive spleen cells alone. (B) Il-2 mRNA levels in naive T cells after 24-h OVA stimulation with tolerant cells in mixed culture in ordinary plates (Mix) or TW culture plates. Conv. represents activated naive T cells in conventional single culture. (C) IL-10 protein levels in the supernatant obtained from cocultures described in (B) were determined by ELISA. Mix and TW show coculture in ordinary plates and TW culture plates. Conv. represents supernatant obtained from conventional single culture. (D) Il-10 mRNA levels in naive T cells after 24-h OVA stimulation with tolerant cells in coculture in ordinary plates (Mix) or TW culture plates (TW). Conv. represents activated naive T cells in conventional single culture. The graphs are shown as of three mice. All data are representative of three independent experiments with three mice per experiment. **p < 0.01, ***p < 0.001, Tukey test (A–D). N.S., not significant. Taken together, these two experimental results indicated that IL-2 suppression in stimulated naive T cells may be induced predominantly by direct cell contact with si-tolerant T cells, but also presumably in part by inhibitory soluble factors such as IL-10 produced by tolerant cells composed of T and/or non–T cells. In fact, IL-2 expression was partially reduced when rIL-10 was added in a single culture of stimulated T cells (Supplemental Fig. 2). Meanwhile, the amount of IL-10 was detected equally in the culture supernatants after coculture in both ordinary and TW culture plates, whereas it was much lower in that of single culture (Fig. 2C). In addition, IL-10 mRNA expression in stimulated T cells also did not significantly differ between those two coculture plates but was clearly enhanced in comparison with that of single culture (Fig. 2D). These results suggest that IL-10 expression of stimulated T cells in coculture may be upregulated mainly by soluble IL-10 produced from tolerant T cells and/or non–T cells, which may be executed partially for IL-2 suppression in a way independent from cell contact with special tolerant T cells. Based upon these results collectively, we focused on IL-2 suppression but not IL-10 as an index for addressing a process of serial transfer of tolerant state in a T cell–specific manner. Based on the above results showing the importance of direct cell contact with si-tolerant T cells for TCR-stimulated naive T cells to reach tolerant state, we tried to determine cell surface molecules that may be engaged in generating the next new si-tolerant T cells by comparing gene expression profiles of si-tolerant T cells and activated naive T cells. For that, CD4+CD25+ T cells were isolated from stimulated naive T cells in conventional culture or in coculture with the si-tolerant T cells described above, and subsequently their RNA extracts were applied to microarray analysis (Fig. 3A). The array results showed that gene expressions of many coinhibitory surface molecules are clearly enhanced at various levels in si-tolerant T cells (Fig. 3B), some of which were confirmed by FACS analysis (Fig. 3C). Among highly expressed inhibitory surface molecules, we focused on TIGIT (T cell immune-receptor with Ig and ITIM domains) first because its expression is limited in Ag-experienced T cells, such as activated T cells, memory T cells and regulatory T cells, but is neither expressed in resting T cells nor in non–T cells such as DCs (16–18). Second, TIGIT is known to strongly bind to a defined ligand CD155 and to transduce a TIGIT-mediated negative signaling into activated T cells (17, 18). Moreover, TIGIT is reported to function not only as a receptor but also as a ligand (19–21), as will be discussed later. TIGIT expression in naive T cells is accelerated by coculture with si-tolerant T cells at an early-stimulation stage. (A) Spleen cells prepared from OVA-TCR-Tg mice receiving in vivo priming with TSST-1 or PBS were restimulated with OVA in vitro (left panel). CD4+CD25+ T cells of activated T cells or si-tolerant T cells were separated by cell sorter (right panel). Numbers indicate the relative percentages of cells in each boxed area. (B) Heat map shows representative inhibitory surface molecule genes differentially expressed in activated T cells (Activate T) and si-tolerant T cells (Si-tolerant T). Total RNA extracts from si-tolerant or activated T cells were each obtained from two experiments and pooled to have sufficient amounts for microarray analysis. (C) FACS analysis of representative inhibitory molecules on CD4+ T cells insi-tolerant T cells (Si-tolerant T, red line) or in activated T cells (Activate T, blue line) after OVA stimulation. Control and Naive represent staining control (dotted line) and unstimulated naive T cells (black line), respectively. Histograms shown are representative of two individual experiments. (D) Left, schematic model for induction of tolerant state into naive T cells for generating the next new si-tolerant T cells. OVA-TCR-Tg spleen cells were stimulated with OVA (0.1 mg/ml) in conventional culture or in coculture with si-tolerant T cells from OVA-GFP mice. Middle, Time course of TIGIT expression in naive T cells that were cultured with OVA (OVA stimulation, red line) in the absence or presence of si-tolerant cells. Upper panels show activated naive T cells in conventional single culture (Activate T). Middle panels show activated naive T cells in coculture with si-tolerant cells (Coculture T). Lower panels show the previously induced si-tolerant T cells that were used for coculture (Si-tolerant T). The black line represents unstimulated naive T cells. The dotted line represents staining control. Histograms show representative three (12 h) or four (24 h) individual mice. Right, Graphs show mean of TIGIT expression of three (12 h) or four (24 h) mice. Each dot represents an individual mouse. MFI, mean fluorescence intensity. (E) Tigit mRNA expression in naive T cells that were stimulated with OVA for 24 h in single culture or in coculture with si-tolerant T cells. Tolerant represents the previously induced si-tolerant T cells that were used for coculture. (F) Tigit mRNA (left) or surface (right) expression in activated naive T cells cocultured with TIGIT-expressed transfectants. BALB/c spleen CD4+ T cells were cocultured with TIGIT-expressing P815 cells (blue), mock transfectants (red), or T cells alone (green) on anti-CD3–coated plates for 24 h. The gray-shaded histogram represents unstimulated naive T cells. The dotted line represents staining control. Data are representative of three independent experiments (E and F) with three mice per experiment. The graph is shown as mean ± SEM of three mice (E and F). *p < 0.05, **p < 0.01, ***p < 0.001, Tukey test (D–F). N.S., not significant. Then, to address whether TIGIT, highly expressed in si-tolerant T cells, is somehow involved in its increased expression of newly stimulated naive T cells, we compared the TIGIT expression level and process in stimulated naive T cells with or without si-tolerant T cells. At the very early stimulation stage (4 h), TIGIT expression of stimulated naive T cells was almost negative in both conventional and coculture. In the following 12- to 24-h culture, however, TIGIT-positive T cells in the stimulated naive T cells were greatly increased after the coculture, particularly in the high TIGIT proportion (Fig. 3D middle, 3E). In comparison, stimulated naive T cells in conventional simple culture gradually showed TIGIT expression, but it was delayed and much lower (Fig. 3D upper, 3E). At the same time, the TIGIT expression level on the first si-tolerant T cells that were used for coculture was already high at the initial stage of 24 h of coculture, and this expression level was further maintained at a steady-state from 24 to 72 h (Fig. 3D lower, Supplemental Fig. 3A, 3B). These results allow us to assume that TIGIT highly expressed on si-tolerant T cells may be involved in accelerating TIGIT expression in the newly stimulated T cells by mutual cell contact, particularly in the early TCR-stimulation stage prior to own TIGIT expression. This process may somehow contribute to serial transmission of the tolerant state. In fact, TIGIT high-positive cells, such as TIGIT transfectant of P815 mastocytoma, also promoted TIGIT expression in naive T cells when they were cocultured in culture plates coated with anti-CD3 Ab (Fig. 3F). Then, to address the molecular mechanism concerning the acceleration of TIGIT expression in the following stimulated T cells, we searched for the surface molecule(s) that binds to TIGIT molecule in the literature. For such molecule(s), we focused on a TIGIT partner, CD155, expressed constitutively on naive T cells first because TIGIT can bind to CD155 with high affinity (22, 23). In this study, CD155 expression is constitutively detectable on naive T cells and is relatively increased in TCR-stimulated T cells, and this increase is higher after coculture (Supplement Fig. 3C, 3D). Further, these two surface molecules, TIGIT and CD155, can mutually transduce negative and positive signaling to function as receptor and ligand, respectively (19–22). In our previous study, cross-linking of CD155 transduced positive signaling into CD4+ T cells (13), thereby inducing Erk phosphorylation and increasing activation of NF-κB (13). Such past information, together with our present results shown in Fig. 3, led us to hypothesize that CD155 on TCR-stimulated T cells may transduce any signaling by trans-interacting with TIGIT on si-tolerant T cells prior to expression of their own TIGIT in coculture and subsequently may contribute to promoting new TIGIT expression on stimulated naive T cells. To address this hypothesis, we performed a CD155 cross-linking experiment with stimulated naive T cells, which may replace CD155-mediated signaling by trans-interaction with TIGIT in the early stimulation stage; CD4+ T cells isolated from BALB/c or OVA-TCR-Tg mice were incubated on culture plates coated with anti-CD3 plus anti-CD155 or anti-CD3 plus isotype control Ig. After 24 and 48 h incubation, T cells treated with double ligation of CD3 and CD155 (CD3/CD155 double ligation) enhanced the TIGIT expression in protein and mRNA levels, but it was less and delayed with CD3 alone or not at all with CD155 alone (Fig. 4A, 4B). 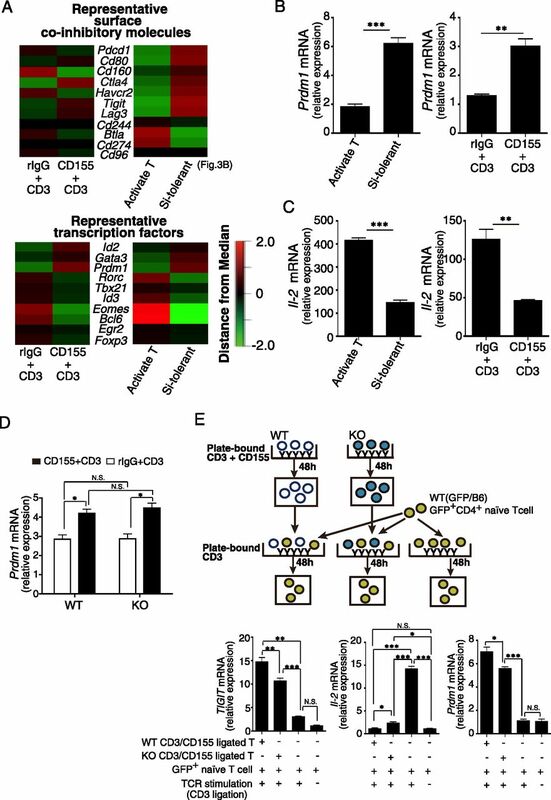 CD155-mediated signaling induces TIGIT expression in TCR-stimulated naive T cells. (A) Left, CD4+ T cells were stimulated by cross-linking with anti-CD3 plus anti-CD155 (CD3/CD155 ligation) or anti-CD3 plus control Ab. Middle, FACS analysis of TIGIT protein expression in T cells by CD3/CD155 ligation for 24 and 48 h. Histograms show representatives of four (48 h) or five (24 h) individual mice. Right, Graphs show mean of TIGIT expression of four (48 h) or five (24 h) mice. Each dot represents an individual mouse. MFI, mean fluorescence intensity. (B) Tigit mRNA expression in T cells that were stimulated by CD3/CD155 ligation or anti-CD3 plus control Ab. (C) Left, CD4+ T cells were stimulated by CD3/CD155 ligation for 48 h (CD3/CD155 ligated T cells). After culture, to distinguish the pre-CD3/CD155–ligated T cells, naive T cells were isolated from GFP-Tg (BALB/c background) spleen and applied to 48 h stimulation on anti-CD3–coated plates in single culture or in coculture with CD3/CD155-ligated T cells. Middle, TIGIT protein expression in naive T cells by coculture with CD3/CD155-ligated T cells (blue line) was promoted compared with by single conventional culture (red line). The gray-shaded histogram represents unstimulated naive T cells. The dotted line represents staining control. Histograms are representative of six individual mice. Right, Tigit mRNA expression in naive T cells by coculture with CD3/CD155 cross-linked T cells was promoted compared with by single conventional culture. The graph is shown as mean ± SEM of three mice. Data are representative of three (B) and two (C) independent experiments with three mice per experiment. *p < 0.05, **p < 0.01,***p < 0.001, Tukey test (A–C). N.S., not significant. To our knowledge, these results provided the first evidence that CD155-mediated signaling plays a role in promoting TIGIT expression in stimulated naive T cells in a DC-independent manner. At the same time, we also examined whether TIGIT, which was highly induced in CD3/CD155-ligated T cells, can also transduce signaling into stimulated T cells to promote newly expressed TIGIT through their own CD155. As shown in Fig. 4C, the TIGIT expression level was much higher when stimulated T cells were cocultured with CD3/CD155-ligated T cells than that with CD3-ligated ones. This acceleration tendency of TIGIT expression in the stimulated T cells was similar to when they were cocultured with si-tolerant T cells as seen in Fig. 3. In both cocultures, stimulated naive T cells are very likely to encounter TIGIT expressed on the coculture partner T cells from the beginning of stimulation and thereby can receive CD155-mediated signaling by trans-interaction with the TIGIT molecules. Collectively, these results indicate that TIGIT promotion in stimulated naive T cells is carried out at least in part through their CD155-mediated signaling after trans-interaction with TIGIT on their culture partners, implying that the highly expressed TIGIT itself seems to play a bridge-like role for promoting new TIGIT expression serially in the next stimulated naive T cells. Then, we further questioned whether CD155-mediated signaling by CD3/CD155 double ligation is also responsible for the serial suppression process as seen in the coculture system shown in Fig. 1. To address this issue, we compared the gene expression profiles of naive CD4+ T cells in CD3/CD155 double ligation versus CD3 single ligation and in coculture with si-tolerant T cells versus in single culture by the use of microarray analysis after preparing the total RNA extracts of those T cells of the respective groups (Fig. 3). The array results showed relatively similar gene expression patterns of coreceptors and transcription factors between naive T cells receiving CD3/CD155 double ligation and the coculture in si-tolerant T cells (Figs. 3B, 5A). This result allows us to propose that CD155-mediated signaling may be engaged in generating tolerant state in the stimulated naive T cells. Blimp-1 expression is enhanced in both si-tolerant T cells and CD3/CD155-ligated T cells. (A) Heat map shows representative inhibitory surface molecule genes and transcription factors that are differentially expressed in activated T cells stimulated by CD3/CD155 ligation or CD3 single ligation (upper left and lower left). Right panels show representative inhibitory surface molecule genes (shown in Fig. 3B) and transcription factors that are differentially expressed in activated T cells (Activate T) and induced tolerant T cells (Si-tolerant). (B) Left, Prdm-1 mRNA expression was increased in CD3/CD155-ligated T cells. CD4+ naive T cells were stimulated by cross-linking for 48 h with anti-CD3 plus anti-CD155 or anti-CD3 plus control Ab. Right, Prdm-1 mRNA expression was also enhanced insi-tolerant T cells. Ac-N represents naive T cells under conventional culture with OVA stimulation for 24 h. Data are representative of three individual experiments with three mice (left) or four mice (right). (C) Left, Il-2 mRNA expression was increased in CD3/CD155-ligated T cells. Right, Il-2 mRNA expression was increased in si-tolerant T cells. (D) Prdm-1 mRNA expression was also increased in CD3/CD155-ligated T cells in TIGIT KO mice. The CD4+ naive T cells of WT or TIGIT KO mice were stimulated by double cross-linking of CD3 and CD155 or CD3 and control rat IgG for 48 h. (E) CD155-mediated signaling representing TIGIT. Prdm-1 expression was higher in WT stimulated T cells in coculture with WT CD3/CD155-ligated T cells than that with KO T cells. Upper, CD4 T cells from WT or TIGIT KO mice spleen were stimulated by CD3/CD155 ligation for 48 h. Then, these CD4+ T cells were cocultured in anti-CD3–coated plates with WT CD4+ naive T cells from GFP-Tg mice, which can be distinguished from pre-CD3/CD155–ligated T cells. After 48-h coculture, mRNA expressions of GFP+CD4+ T cells from each coculture group were examined. WT mix and KO mix show coculture with WT CD3/CD155-ligated T cells or KO ones, respectively. Lower, Tigit, Il-2 and Prdm-1 mRNA expressions in activated WT T cells cocultured with CD3/CD155-ligated T cells from WT or TIGIT KO mice. The graph is shown as mean ± SEM of three mice. Data are representative of two (D and E) or three (B and C) independent experiments with three mice per experiment. *p < 0.05,**p < 0.01, ***p < 0.001, unpaired Student t test, two-tailed (B and C), Tukey test (D and E). N.S., not significant. Because CD155 is known to transduce positive signaling, we payed attention to the enhanced genes acting downstream of CD155, which may function to regulate others. In such genes, the interesting one is Prdm-1 encoding B lymphocyte-induced maturation protein 1 (Blimp-1), because Blimp-1 is known to be a transcription repressor to coordinate with other transcription factors for regulating transcription of cytokines including IL-2 in effecter T cells in a negative feedback loop (24–27). The mRNA level of Prdm-1 in stimulated naive T cells was clearly enhanced both in the si-tolerant T cells and CD3/CD155-ligated T cells in comparison with that in T cells receiving CD3 alone ligation and in simply cultured T cells (Fig. 5B). The enhanced Blimp-1 expression was accompanied by decreased IL-2 expression as shown in Fig. 5C. These results indicated that CD155-mediated signaling induces the promotion of gene expression of Prdm-1 in stimulated naive T cells, which may lead to their IL-2 suppression to become tolerant state. As mentioned in this and previous sections, CD155-mediated signaling contributes to the promotion of the expression of Blimp-1 and TIGIT (Figs. 3–5). In both molecules, the former is responsible for providing suppression potential into the stimulated T cells, and the latter contributes to further transducing CD155-mediated signaling into the next newly stimulated T cells through trans-interaction with their CD155. Therefore, trans-interaction based on the TIGIT-CD155 axis in stimulated naive T cells and si-tolerant T cells may play an important role for the serial transmission of tolerant state by providing CD155-mediated signaling across generations of stimulated T cells. At the same time, the above results remain unclear in terms of whether TIGIT is indispensable for CD155-mediated signaling for promoting TIGIT and Blimp-1 expression because CD155 can interact with several partners other than TIGIT. To address this, we used TIGIT KO mice (Supplemental Fig. 4) and prepared T cells from TIGIT KO and WT mice to use for CD3/CD155 double ligation culture, in which T cells can receive CD155-mediated signaling directly without any TIGIT–CD155 interaction. The Blimp-1 expression levels of KO and WT T cells were equally elevated in comparison with those of T cells in CD3 alone ligation (Fig. 5D). Then, each of these CD3/CD155-ligated T cells was cocultured with stimulated naive T cells on anti-CD3–coated plates to examine their potential to transduce CD155-mediated signaling into the coculture partner cells. The results showed that the expression levels of Blimp-1 and TIGIT were sufficiently high in coculture with WT T cells but were lower in KO T cells (Fig. 5E), which was presumably due to the presence of other TIGIT partners such as CD226. Recent studies showed that CD155 also interacts with CD226, and CD226 competes with TIGIT for ligand (23). In fact, surface expression of CD226 on T cells in KO mice was clearly detectable and was slightly higher than that of WT mice (data not shown). Collectively, a TIGIT molecule may not be indispensable, but it presumably does play a more effective role in transducing CD155-mediated signaling to promote expression of Blimp-1 and TIGIT in stimulated T cells than other CD155 partners do (Fig. 6). TIGIT-expressing si-tolerant T cells are able to transmit tolerance to naive T cells receiving Ag stimulation via CD155–TIGIT pathway. 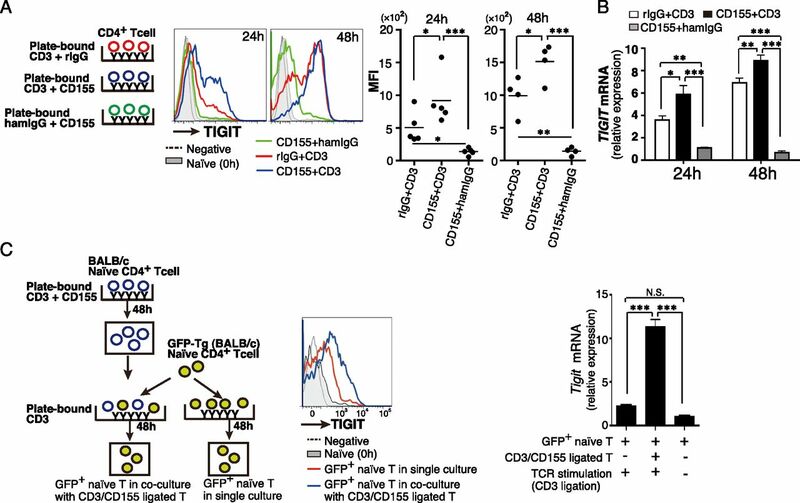 CD155 on naive T cells interacts with TIGIT on the first si-tolerant cells with TCR stimulation, resulting in activated CD155 signaling to naive T cells. Next, TIGIT and Blimp-1 expression in naive T cells is enhanced, and IL-2 expression is then suppressed, accompanied by enhancement of Blimp-1 in naive T cells. As a result, naive T cells become the second-generated si-tolerant T cells. 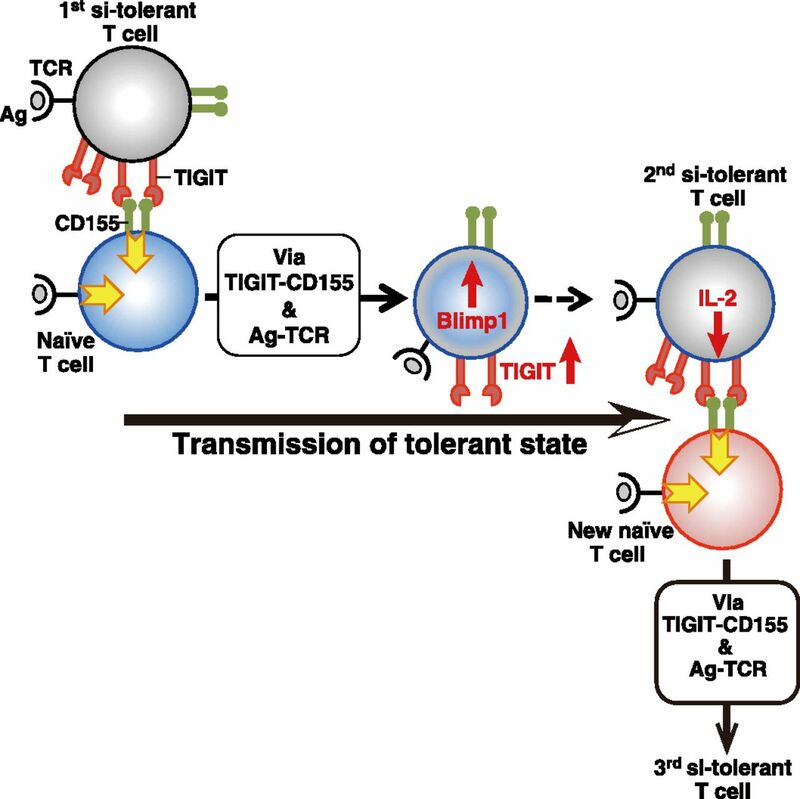 TIGIT-positive si-tolerant T cells are successively transmitted into naive T cells through de novo TIGIT whose expression is promoted by trans-interaction with own CD155. For a better understanding of how an unresponsive state is maintained in a certain subset of Ag-experienced T cells, we established an in vitro experimental system in which, when naive T cells were cocultured with the already induced tolerant T cells (first tolerant T cells) upon stimulation, they were tolerant. Similar to the initially induced tolerant T cells, these newly induced tolerant T cells (second generation of tolerant T cells) also have a potential to lead new stimulated naive T cells to be tolerant by coculture. Based on these results, we can propose a novel process by which tolerant state induced in Ag-experienced T cells is serially succeeded into new activated naive T cells to maintain the long-lasting suppression across the generations as one process of the regulating mechanisms in immune responses other than the induced long-lived tolerant T cells. This proposed scenario is shown in Fig. 6. For driving this successive process of tolerant state, we showed in this article that trans-interaction of the TIGIT–CD155 pathway plays an important role. In this study, we found a new function of TIGIT that can work as a ligand for transducing signal through its receptor CD155 expressed on stimulated naive T cells to promote gene expression of TIGIT (Figs. 3, 4): When stimulated naive T cells receive CD155-mediated signaling by trans-interaction with TIGIT on tolerant T cells in the beginning of the stimulation, their TIGIT expression was enhanced and accelerated to support them to become the second TIGIT-highest T cells, a status that is then succeeded by the next stimulated T cells, serially. We also found that CD155-mediated signaling by trans-interaction with TIGIT-induced Blimp-1 enhancement in stimulated naive T cells when they were cocultured with si-tolerant T cells or they received CD3/CD155 ligation. Because Blimp-1 is reported to engage in the suppression of several cytokines including IL-2 (24–27), these results, together with TIGIT promotion, suggest that CD155-mediated signaling under the TIGIT–CD155 axis may contribute to the stimulated T cells to become tolerant in cooperation with serial TIGIT promotion. The majority of past reports showed that TIGIT functions as an inhibitory receptor to modulate T cell activation (17–19), such as IL-2 production and cell proliferation, either directly by induction of TIGIT-mediated signaling after treatment with agonistic anti-TIGIT Ab or indirectly by binding with its partner CD155 expressed on DCs that are introduced to be tolerogenic (22). Taken together with our present results, it is indicated that TIGIT has a double function to suppress cell proliferation of T cells, through TIGIT-mediated signaling by their own TIGIT and through CD155-mediated signaling by trans-interaction with TIGIT on the adjacent cells. Thereby, the results of our study are not competing with those past reports. TIGIT is reported to express on regulatory T cell subsets exemplified by Foxp3+Treg cells (28–30), which is consistent with the described past observation (17–19, 22) that TIGIT is substantially engaged in maintaining a tolerant state in the expressing regulatory T cells as an inhibitory receptor probably by receiving negative signaling. However, these reports did not clarify whether TIGIT renders regulatory T cells to possess suppression capacity for newly stimulated T cells. According to our present results of si-tolerant T cells showing an important role of the TIGIT–CD155 pathway for obtaining suppressive capacity, TIGIT on Foxp3+Treg cells is presumed to function by suppressing activation of newly stimulated T cells by trans-interaction with their own CD155. In consideration of the important role of regulatory T cell populations for regulating immune responses and their therapeutic role for autoimmune diseases as well as for transplanted tissues, further study will be required to clarify the cell fate of TIGIT positive T cells. For instance, TIGIT appears transiently after TCR stimulation of naive T cells but then gradually decreases after Ag disappears, but their cell fates are now unclarified: to die by induced activation cell death, or to be TIGIT-expressing memory T cells and/or Foxp3+Treg cells. In contrast, our si-tolerant T cells maintain higher and longer TIGIT expression, which may be caused by early TIGIT expression through CD155 mediated at the early stage of TCR stimulation. In fact, our preliminary data showed that antiapoptotic-related genes such as BcL-2 were highly expressed in si-tolerant T cells induced by CD3/CD155 double ligation in comparison with that of ordinary activation T cells. At the same time, it should also be elucidated whether TIGIT high regulatory T cells can be long lived or whether they disappear after they induce the next generation of tolerant phenotypic T cells in newly stimulated T cells in an Ag-specific manner. We are now challenging these issues. We thank Fumitaka Kawai for technical help and Masataka Kasai for critical reading of the manuscript. We also thank Alfred Singer and Masanobu Satake for reading of the manuscript and discussions. We are thankful to Yukihiro Kobayashi of the Department of Indoor Environment Neurophysiology Research, Juntendo University, for supporting some studies related to this work. This work was supported by a Grant-in-Aid for Scientific Research (B) (21390154 to S.H. and 23390260 to K.O.) and in part by the Strategic Research Foundation Grant-Aided Project for Private Universities (to N.N. ; S1411007) from the Ministry of Education, Culture, Sport, Science, and Technology, Japan. The microarray data presented in this article have been submitted to the Gene Expression Omnibus database (http://www.ncbi.nlm.nih.gov/geo) under accession numbers GSE95362 and GSE112916.
. 1995. Immunologic self-tolerance maintained by activated T cells expressing IL-2 receptor alpha-chains (CD25). Breakdown of a single mechanism of self-tolerance causes various autoimmune diseases. J. Immunol. 155: 1151–1164.
. 2003. Control of regulatory T cell development by the transcription factor Foxp3. Science 299: 1057–1061.
. 2008. CD4+ FoxP3+ regulatory T cells confer infectious tolerance in a TGF-beta-dependent manner. J. Exp. Med. 205: 1975–1981.
. 2008. Regulatory T cells and immune tolerance. Cell 133: 775–787.
. 2008. How regulatory T cells work. Nat. Rev. Immunol. 8: 523–532. 2009. Mechanisms of foxp3+ T regulatory cell-mediated suppression. Immunity 30: 636–645.
. 2011. Sustained suppression by Foxp3+ regulatory T cells is vital for infectious transplantation tolerance. J. Exp. Med. 208: 2043–2053.
. 2012. Foxp3 expression is required for the induction of therapeutic tissue tolerance. J. Immunol. 189: 3947–3956.
. 1994. Naive T cells can mediate delayed-type hypersensitivity response in T cell receptor transgenic mice. Eur. J. Immunol. 24: 1512–1516.
. 2009. Heterogeneity of natural Foxp3+ T cells: a committed regulatory T-cell lineage and an uncommitted minor population retaining plasticity. Proc. Natl. Acad. Sci. USA 106: 1903–1908.
. 2015. CD155 (PVR/Necl5) mediates a costimulatory signal in CD4+ T cells and regulates allergic inflammation. J. Immunol. 194: 5644–5653.
. 2008. Rapid histone deacetylation and transient HDAC association in the IL-2 promoter region of TSST-1-stimulated T cells. Immunol. Lett. 119: 97–102.
. 2012. Reciprocal control of G1-phase progression is required for Th-POK/Runx3-mediated CD4/8 thymocyte cell fate decision. J. Immunol. 189: 4426–4436.
. 2013. Molecular mechanisms of T cell co-stimulation and co-inhibition. [Published erratum appears in 2013 Nat. Rev. Immunol. 13: 542.] Nat. Rev. Immunol. 13: 227–242.
. 2011. Cutting edge: TIGIT has T cell-intrinsic inhibitory functions. J. Immunol. 186: 1338–1342.
. 2012. The TIGIT/CD226 axis regulates human T cell function. J. Immunol. 188: 3869–3875.
. 2016. Lag-3, Tim-3, and TIGIT: co-inhibitory receptors with specialized functions in immune regulation. Immunity 44: 989–1004.
. 2015. Balancing natural killer cell activation through paired receptors. Nat. Rev. Immunol. 15: 243–254.
. 2016. Nectin spot: a novel type of nectin-mediated cell adhesion apparatus. Biochem. J. 473: 2691–2715.
. 2009. 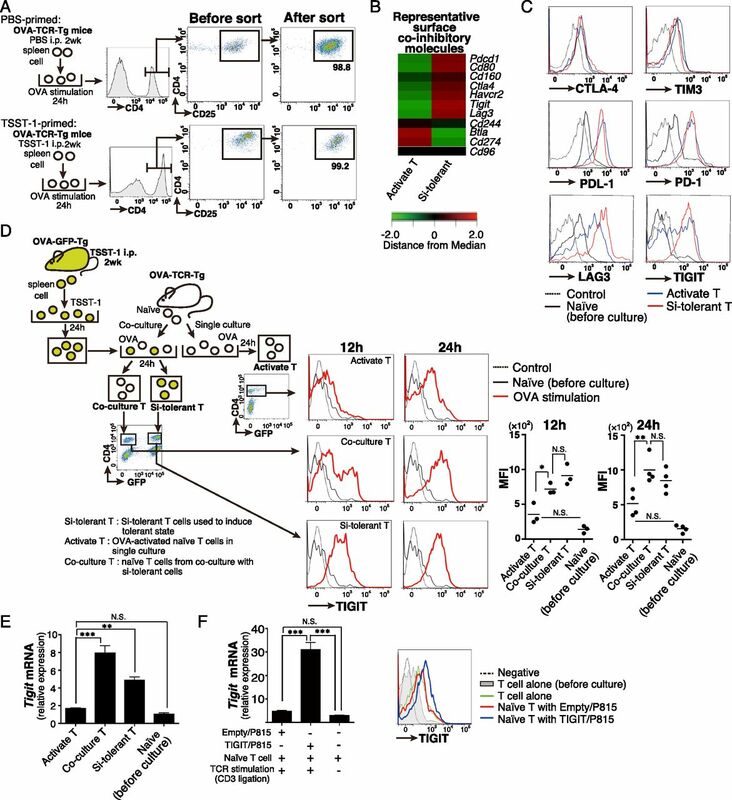 The surface protein TIGIT suppresses T cell activation by promoting the generation of mature immunoregulatory dendritic cells. Nat. Immunol. 10: 48–57.
. 2012. Structure of TIGIT immunoreceptor bound to poliovirus receptor reveals a cell-cell adhesion and signaling mechanism that requires cis-trans receptor clustering. Proc. Natl. Acad. Sci. USA 109: 5399–5404.
. 2006. Transcriptional repressor Blimp-1 regulates T cell homeostasis and function. Nat. Immunol. 7: 457–465.
. 2007. Cytokine-dependent Blimp-1 expression in activated T cells inhibits IL-2 production. J. Immunol. 178: 242–252.
. 2008. Regulation and functions of Blimp-1 in T and B lymphocytes. Annu. Rev. Immunol. 26: 133–169.
. 2008. Blimp-1 directly represses Il2 and the Il2 activator Fos, attenuating T cell proliferation and survival. J. Exp. Med. 205: 1959–1965.
. 2013. Genome-wide DNA methylation analysis identifies hypomethylated genes regulated by FOXP3 in human regulatory T cells. Blood 122: 2823–2836.
. 2014. Treg cells expressing the coinhibitory molecule TIGIT selectively inhibit proinflammatory Th1 and Th17 cell responses. Immunity 40: 569–581.
. 2015. Divergent phenotypes of human regulatory T cells expressing the receptors TIGIT and CD226. J. Immunol. 195: 145–155.